A photovoltaic or a solar heating system is an investment that must maintain its original operating features in order to maximize its energy yield and the Return Of Investement.The common losses of the produced energy in photovoltaic systems are for instance:Due to soiling, from 1% to 10% in normal cases and up to 80% in extreme ones. in the field of protective coatings of glass photovoltaic surfaces and solar heating modules, which contributes to the increase of the systems’ performance.It reduces the required maintenance of the PV modules and at the same time protects them against deposits caused by hard water, environmental pollutants and the wear that occurs over time. SOLARSKIΝ™ PROVIDES EXACTLY THESE SOLUTIONS. Το SOLARSKIΝ™ is available on the market in the following three packages. Α. Three containers of 1 liter each. This package is sufficient for photovoltaic systems of 10 kWp. C. Two containers of 10 liters each. This package is sufficient for photovoltaic systems of 100 kWp. In this case, the first constituent that offers restoration and protection of the glass surface is not included. It is suitable for relatively new facilities, which are rather frequently cleaned. FULL RESTORATION OF CORRODED GLASS SURFACE. SOLARSKIΝ™ ™ provides complete restoration of the degenerated and “eroded” glass surface of photovoltaic and solar thermal components. Damage is usually caused by long-term use and the accumulation of dirt inside the panel through glass pores. SOLARSKIΝ™ cleans photovoltaics and solar heating components in depth, restoring them to their original state, contributing indirectly to the increase of transmission of the radiation. Specifically, it decontaminates and polishes the surface, while at the same time it eliminates scratches and scrapes. After applying this innovative product, the glass returns to its original brand new condition and it looks as flawless as the moment it left the production line of the manufacturing plant, before it was exposed to outdoor environmental conditions. In contrast, the products of competitive brands do not restore the glass surface before the application of the coating; therefore theglass does not have the same flatness, the same transparency, or the same grip to the substrate it initially had. PRESERVATION OF THE IDEAL GLASS ROUGHNESS TO MAXIMIZE THE PERFORMANCE. The protective glass of semiconducting elements of the photovoltaic has been under heat curing process and, depending on the manufacturer, its thickness is between 3 to 6 mm. Systems’ energy loss is the result of the reflection of solar radiation on the glass surface. Global researches have proved that when certain roughness is given to the glass, the reflection loss is reduced, but the increase of the average route that the radius travels is increased, so correspondingly the absorption loss is increased, too. Therefore, there is a critical point in the textured surface of the glass (i.e. an ideal level of roughness), whose maintenance, ensures an average annual increase of the performance of the photovoltaic, at least 8%. The texture of that relief, which microscopically has usually the form of inverted pyramid, waves or pyramid-shaped grooves, is being gradually destroyed due to environmental conditions, abrasive means and detergents during cleaning and other factors causing a gradual wear of the surface’s relief. The innovative preparation of the glass surface of the solar module during the application of Solarskin ™ ensures the preservation of this relief, while the final coating protects it for years to come. Eventually the benefit derived from the stabilization of its proper operation is increased. Hydrophobicity is the tendency of certain substances to be combined by excluding water molecules. The hydrophobicity of a surface is characterized by its contact angle with water. As contact angle is defined the angle in which the interface between gas-liquid meets the solid surface. Super-hydrophobic surfaces are characterized by big contact angles (over 90 °). Hydrophobicity is connected to easy cleaning / self-cleaning, because when a surface is wetted, the water is removed without leaving any salts .At the same time, the small drops are brought together into larger ones and as they flow on the surface remove any pollutants (leading them out of it). This effect is known in international bibliography as the Lotus effect. The effect is named after the plant that has the capacity to be self-cleaned with water. A simulation of this natural mechanism happens in hydrophobic materials basically when using silicon dioxide as a basic structural unit. The glass surface of the photovoltaic modules after the application of Solarskin™ is transformed into super-hydrophobic. This property contributes to the removal of rainwater from the surface of the modules, dragging dirt, dust and pollutants. Thus, the PV modules develop self-cleaning mechanisms and their regular cleaning becomes very easy. In advanced markets relevant coating products of hydrophilic coatings based on titanium dioxide (TiO2) can be found. The self-cleaning mechanism of these products is based on the phenomenon of photo-catalysis which requires simultaneous presence of humidity and light conditions on the glass surface. When this happens, only a small percentage of organic pollutants decomposes, that are a small percentage of the total pollutants [inorganic (metal oxides, salts, powder) and organic (oils, exhausts)] that “attack” a photovoltaic panel. It becomes clear that the hydrophilic coatings are not profitable. Furthermore, their application is difficult on the spot because specialized techniques and equipment are required. Super-hydrophobic Solarskin™ is the most effective product in the market because it removes 100% of the inorganic and 95% of the organic soil. In Solarskin™ hybrid nanostructures are used aiming to the combination of properties in order to give the material the best possible behavior under given conditions while maintaining its maximum performance in a variable range of conditions. APPLICATION OF 2ND GENERATION NANOTECHNOLOGY TECHNOLOGIES. The production of Solarskin™ is based on the latest technology generation in creating aqueous suspensions and hybrid oligomers of silicon. BFP ADVANCED TECHNOLOGIES produces advanced nanostructures for either the preparation of the substrate, or the direct application of the coating layers. For the productions of its products in the form of nano-particles or thin films, the company uses classic techniques, such as the techniques of co-precipitation and sol-gel, as well as highly advanced techniques such as the technique of chemical vapor deposition from organometallic sources and the technique of thermal decomposition in the gas phase for special applications. It makes no use of outdated technologies (e.g. fluoropolymer or silicone oils),on which the majority of hydrophobic coatings that are currently in market are based. These coatings usually have a life expectancy of several months. Additionally in some cases, the same coating substantially prevents the transmission of radiation, so that the benefit in performance due to easy cleaning is eliminated, either because of unwanted reflections, or due to the increased absorption of radiation from the coating material itself. Compared to hydrophilic films which are manufactured by photocatalytic materials, the advantage of Solarskin™ is obvious, too. Hydrophilic materials are able to decompose organic substances, but operate satisfactorily only in laboratory conditions as in most cases the simultaneous presence of moisture and light is not possible. In addition, the majority of environmental contamination is of inorganic nature; therefore, materials which have the potential to decompose only a small part of the total pollution are of limited application. At the same time, our scientific researches and measurements have shown that hydrophobic coatings can be self-cleaned much more easily than the hydrophilic ones. With the application of Solarskin ™, a percentage of 90% of liquid contamination may be self-cleaned without preventing the transmission of radiation. In this way, cleaning cycles are significantly reduced. GREAT OPERATING ENDURANCE FOR AT LEAST 7 YEARS. Solarskin™ is so highly durable due to the strong covalent bond (on the order of 230 KJ / mol) which the coating develops with the substrate as well as the innovative preparation of the surface that ensures optimum grip of the overlapping film. This means that the coating film shares electrons with molecules of the glass itself, becoming part of the glass. The covalent bonds are even 20 times stronger than hydrogen bonds and the weak forces VanderWaals, which are the common types of bonds that are developed in common waterproofing coatings. Endurance is reduced by 20% after about 15,000 cleaning cycles, equivalent to a final contact angle 84° to 88°. However, even after such a decrease, it remains higher or about the same with the initial contact angle (typically 80° to 90°), which is achieved by most of the anti-reflective films on the market. In other words, the combination of anti-reflective and self-cleaned properties may sound attractive, but the real benefits for the transmission of solar radiation through the panel are rather ambiguous, especially if we add the fact that sometimes the losses of the electrical energy caused by the pollution of the modules are higher than the losses caused by reflection, or by uneven shading, or by the specific features of the area in which they are installed. Solarskin™ comes with seven years warranty from the day of its application and up to 15.000 cleaning cycles. Solarskin™ stops the natural damage and blurring that occurs over time in each glass surface that is located outdoors and is exposed to weather conditions. This product offers a unique solution regarding the protection and performance of PV modules. The mechanical degeneration, i.e. the erosion due to contact with various particles that gradually causes aging is irreversible, but the application of Solarskin™ strops this erosion. This means that there will be no further reduction in the performance of the module from the application of the material and thereafter. The chemical degeneration, i.e. the erosion of the glass due to the pollutants that have been absorbed into the glass and cannot be cleaned when using chemical cleaners, therefore leaving a slight blur that grows over the years. This degeneration is totally reversible and completely eliminated with the application of Solarskin™. The performance of the modules will be increased by a few percentage points immediately after the application of the material. Solarskin™ coating has a porous structure which neither insulates nor “seals” the substrate allowing it to “breathe” (steam may escape). By definition a hydrophobic material is water-repellent. A properly designed hydrophobic material must prevent the condensed moisture from penetrating the hydrophobic surface (e.g. so that moisture can’t penetrate a module), and at the same time should allow water vapor to escape. Technically, this is possible, because water molecules in the gaseous phase are smaller than in the liquid phase, so they are able to escape through the micro-pores of the material. Therefore, penetration of the environmental humidity inside an area through the hydrophobic material is delayed, while the output of moisture from the interior to the surroundings is accelerated. Solarskin™ is breathable, NOT sealant and does not close the pores of the surface and also achieves excellent coverage of the edges (step coverage), following the topographic anaglyph of the surface it is applied on, thus ensuring a healthy and pleasant living environment. Unlike most nanotechnology materials that “seal” the surface, Solarskin™ a) permits vapors (which gradually cause chemical degeneration of the glass, the so-called erosion of the glass) to escape unobstructed and b) allows the uninterrupted transmission of solar radiation without absorbing it. PROTECTION AGAINST THE LOCAL OVERHEATING OF THE INTERIOR OF THE PANELS. The accumulation of dirt can cause local overheating in the interior of the modules. This occurs when a single solar cell in an array produces less electrical current than it normally does, either because it is faulty or because it is shadowed by pollutants. As a result, heat is produced instead of electricity . This phenomenon leads to the reduction both of the performance and the lifespan of the photovoltaic system because of the wear caused by overheating. The problem is solved with the application of Solarskin™ that prevents the accumulation of dirt. HIGH RESISTANCE TO CHEMICAL PRODUCTS & CLEANERS. High resistance to chemicals which are used for cleaning the photovoltaic modules (resistance in a strongly alkaline environment, pH up to 12). After the application of Solarskin™, the surfaces can be cleaned with common cleaners / detergents. HIGH ENDURANCE TO HIGH TEMPERATURES (>400°C) & TEMPERATURE VARIATIONS. USER FRIENDLY & ENVIRONMENTALLY FRIENDLY. GREEK LEGAL PATENT & PRODUCTION. The production process of Solarskin™ is a legal patent applied by the scientific team BFP ADVANCED TECHNOLOGIES. Iris Hellas holds the exclusive distribution rights. 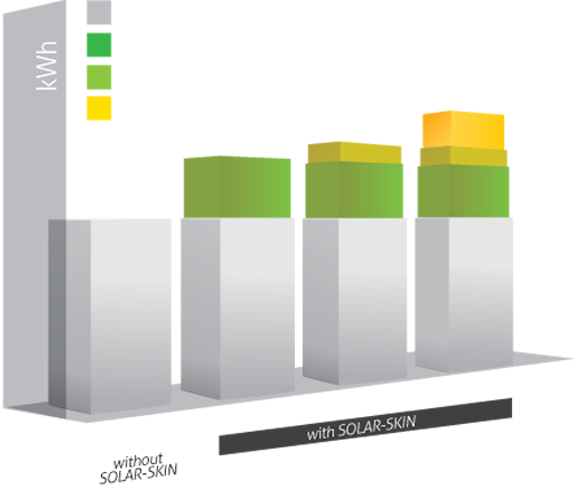 Solarskin™ derived as a product of processing raw materials which fully complying with the stipulated terms of the Regulation (EC) No. 1907/2006 of the European Parliament and of the Council, regarding the registration, evaluation, authorization and restrictions of chemical products (REACH). That regulation has replaced the Directives 67/548 and 1999/45. Solarskin™ is registered in the State General Laboratory and the D.D.A. comply with the REACH Regulation No. 1907/2006 / (EK), Article 31 and the Regulation No. 453/2010 (EU). The entry meets the new legislation CLP, which has become mandatory for all chemicals since 01.06.2015. CERTIFICATIONS FOR RELIABILITY AND PERFORMANCE. > > Quality management system in production by ISO 9001: 2008.